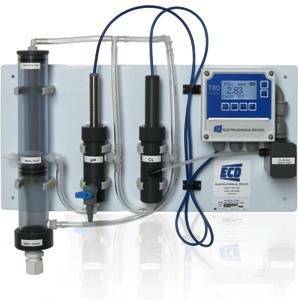 Reagentless Free Chlorine Analyser: The ECD FC80 Free Chlorine Analyser is a panel mounted, ready to use Free Chlorine Analyser. It is designed to monitor free chlorine (residual chlorine) in drinking water, industrial cooling and rinse water, wastewater or other fresh water samples containing chlorine in the range of 0.05-20 ppm Cl2 (High Range) or 0.01 to 5.00 Cl2 (Low Range). The FC80 Free Chlorine Analyser features a plug and play design that incorporates a flow control device, a pH sensor, a chlorine sensor and the T80 transmitter are conveniently mounted on a PVC panel. Connect the sample and drain lines, connect the power and outputs and it is ready to use. The FC80 Free Chlorine Analyser is calibrated at the factory before shipment, additional Calibrations are accomplished by DPD comparison. No Reagents Required: the FC80 Free Chlorine Analyser sensor technology and automatic pH compensation is a reagentless design and keep the cost of ownership low without having expensive reagents. Automatic Flow Control and Large Flow Tubes and Cells: greatly reduces clogs and blockages of the analyser which is a common problem in other free chlorine analysers and allows for easy cleaning. Panel Mounted System Plumb and Play Design: the Free Chlorine Analyser comes complete and is easy to install and ready to use. T80 Analyser Capability: TDual Measurements (2) 4 to 20 mA output, MODBUS and/or HART communication, (3) Alarm Relays, 24 VDC or 110/220 AC Power. Auto Cleaning Option: The FC80 Free Chlorine Analyzer can be ordered with an auto cleaning option to keep the chlorine clean from contaminates for an extended period of time.